1870s autograph album that belonged to "Belle", who was presumably a student at Skowhegan High School at Skowhegan, Maine, possibly in the Class of 1876 or earlier. The album is unusual in that all of the inscriptions are written upside down, and as if the back cover were the front. Because of that, it's possible that the inscriber on the last end paper of the album might be the album's owner, Belle Parlin of Bingham, Maine, who dated her page April 3, 1873. The album measures approximately 5-1/4" by 3-1/4" and contains the sentiments of nearly 70 of Belle's relatives, friends and schoolmates. An alphabetical list of the inscribers, together with any personal information they offered, appears at the end of this post. According to a record in the Maine, Nathan Hale Cemetery Collection, ca 1780-1980, Isabella Parlin, "Belle", was born April 24, 1856 and died June 21, 1923, with the married surname of Williams. I believe Belle was born at Concord, Maine, the daughter of Ephraim Wood Parlin and Eveline (Leadbetter) Parlin. See another post that features an 1864 document where Charles Grant sold livestock to Ephraim W. Parlin. 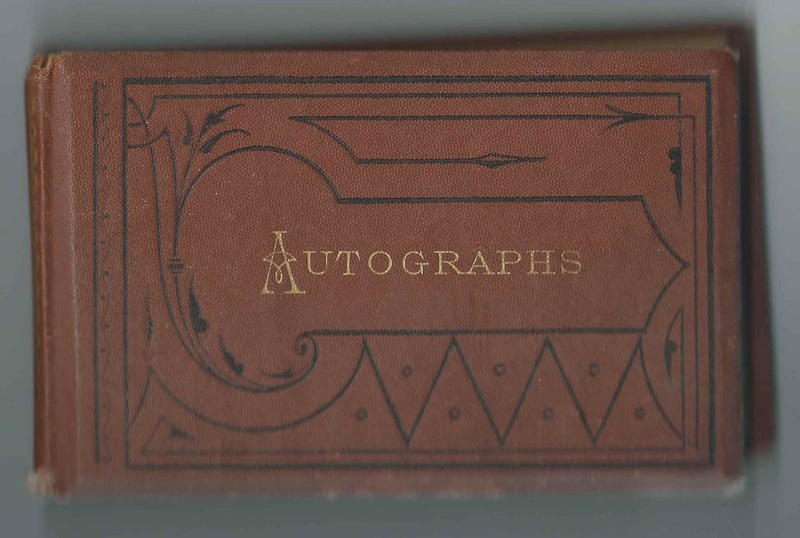 Belle had a sister, Helen R. Parlin, who inscribed a page in the album, on the page before [or after, using the strange format] her sister Belle. Sadly, Helen died in 1879; she was then the wife of Dr. Fred G. Williams, a native of Athens, Maine. Belle married her sister's widower, Dr. Fred G. Williams, at Pleasant Ridge Plantation, Maine, on October 11, 1881. Fred died on July 14, 1916 and is buried in the Village Cemetery at Bingham, Maine, with Nellie and Belle. I'm not sure if Dr. Williams had children with either of his wives. If you have additions and/or corrections, or an alternate theory as to the identity of album owner "Belle", or information on any of the inscribers listed below, please leave a comment or contact me directly. Florence Haynes; inscribed on April 3, 1873. Can't read her first initial. 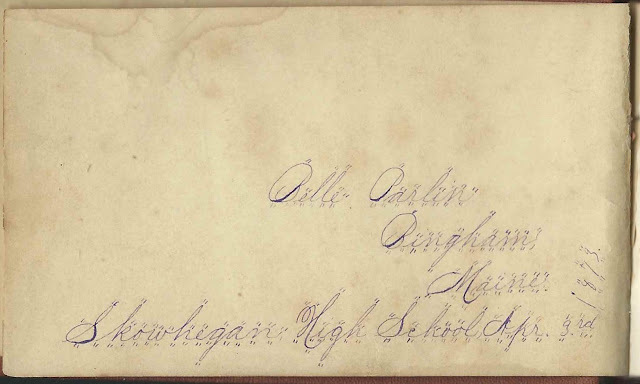 Belle Parlin of Bingham, Maine; inscribed at Skowhegan High School at Skowhegan, Maine; on April 3, 1873. Possible album owner, if she started the album upside down from the back and had all of her inscribers follow her that way. 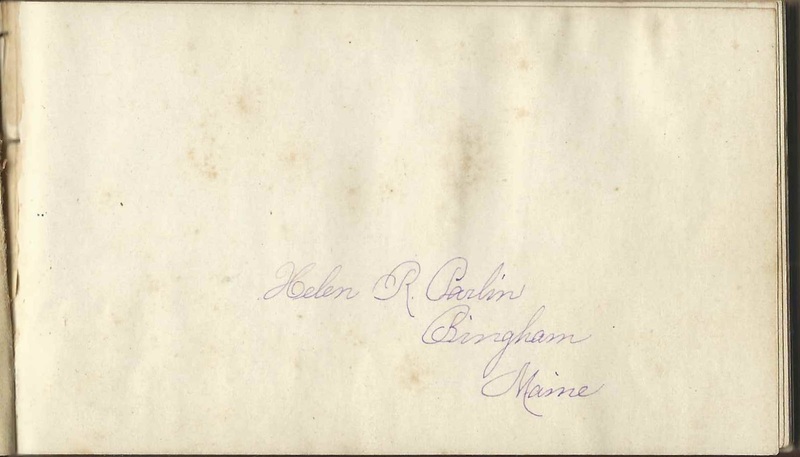 Isabelle Parlin, "Belle"
Stephen F. Parlin of Skowhegan, Maine; inscribed on April 4, 1873. "Remember the spring term of 1873. S.P."